I’m not at my desk very often, so when I am, I need to be productive. And because I’m not at my desk very often, when I am, I need to make sure I stay in decent shape. We have been seeing more studies on the dangers of too much sitting during the day. It makes a difference. Take time to read on! In the midst of this article, they referred to the Pomodoro Technique. I’ve used it for the past week, and it has really helped me be more focused and productive while I’m at my desk. Created in 1992 by Francesco Cirillo, who based everything around a simple kitchen timer. A ‘pomodoro’ is indivisible—lasting at the very least 25 minutes. So for 25 minutes you focus on a task. After one ‘pomodoro,’ you take a short 4-5 minute break. But make that productive. Do some situps, crunches, something to keep you active and alert. After that is done and nothing else is pressing, you put on another pomodoro, then take another short break. After four pomodoros, you take a 15 minute break. Walk around your building, climb some stairs, more pushups/situps, etc. If you have an interruption that takes you away, you’ve lost your pomodoro (remember, they are indivisible). If something else comes across your mind that is urgent, write it down on another sheet of paper, and deal with that (maybe during your break). You can download the PDF of the Pomodoro Technique, along with PDF’s of other sheets to help you along with a Cheat Sheet, To Do Today Worksheet, and Activity Worksheets. You can also download free apps from the iTunes Store. Just search for Pomodoro and you will get a number of options. Some do cost, but try the free ones out to see if you like it. What are some other ways you have found to exercise during the day in an office job, and other ways that have improved your time management and productivity? What we observe this morning is not merely a man-made tradition, but what is known as an ordinance—this is something that Jesus Christ himself ordained for the church to do (the other being baptism). If this is all that Jesus ever told us about the importance of this ordinance, that would be enough for us to observe it. It’s of such great importance, that this is referred to in Matthew, Mark, Luke, and 1 Corinthians and alluded to in John. Gregg Allison reminds us, “Baptism is the initiatory rite of the Christian faith; the Lord’s Supper is the continuing rite.” From earliest times in the church, baptism is a part of this experience of the Lord’s Supper. Baptism is the very basic and very first step of obedience—ordained by Christ himself. And from earliest times, if this basic, primary, and obvious step of obedience is not observed, one was not permitted to partake of the Supper. Clearly, an area of our Christian walk needed to be addressed! But the fact is, there is no timetable—only that it be observed. Why? The symbols of the bread and wine stand as a memorial to what Christ has accomplished to redeem his people. They are signs of the real thing. My aim, like Dr. Ryle’s, is for us not to be ignorant of the subject. Christ called for us to observe it, and observe it we shall. With a gravity, a joy, a simplicity, and a connection—that connects us to all believers everywhere, past and present, 1st world to 3rd world, rich or poor… the ground is level at the foot of the cross! 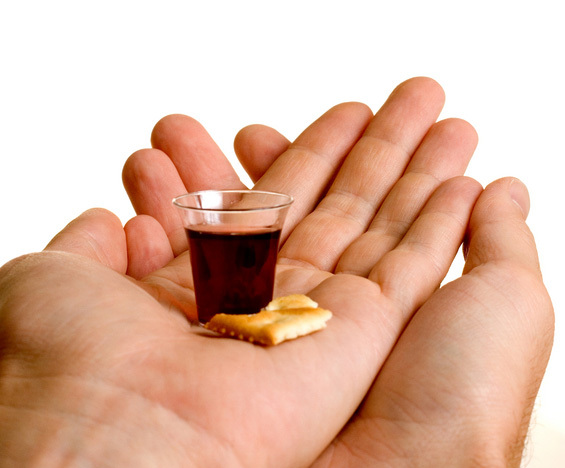 The Lord’s Supper stands as a banquet upon which all of God’s people may feast. 1. Will you recognize whose Supper this is? They were coming together, but they were not unified. In fact, coming together was not for better but for worse—it would have been better if some of them had stayed home. You see, in those days, they would come together for a full meal, then observe the Lord’s Supper, followed by a sermon. Paul says that there were divisions among them. The word ‘divisions’ comes from the word schismata which literally means a tear. The word ‘faction’ in verse 19 is the word where we get the word ‘heresy’ –a faction or party geared around an opinion! So in essence a differences of opinions that lead to heresies that divide the church. In the Corinthian church, there were many divisions, but these types of divisions came from good intentions. At the beginning, it was a division over which preacher they followed (“I follow Paul, I follow Apollos, I follow Cephas, I follow Christ”). Then there was division about Paul himself (he was unimpressive physically as well as in speech). But there were divisions about problematic issues! There was division about how to deal with blatant sexual immorality in the church (1 Corinthians 5:1-13). There was division about the boundaries of marriage, divorce, and remarriage (1 Corinthians 7). There was division on eating food sacrificed to idols (8-9). There was division regarding women’s roles in the church, spiritual gifts, speaking in tongues. In other words, Corinth was a mess—everyone was bringing forth their opinion, then folks would choose camps, then there would be shouting—and the shouting would turn to shooting their wounded. 21For in eating, each one goes ahead with his own meal. One goes hungry, another gets drunk. 22What! Do you not have houses to eat and drink in? Or do you despise the church of God and humiliate those who have nothing? What shall I say to you? Shall I commend you in this? No, I will not. As we read this, you may have noticed something startling in how the Holy Spirit inspired the Apostle Paul. In verse 19, we read, “19for there must be factions among you in order that those who are genuine among you may be recognized.” The word ‘genuine’ means those who have been tested and approved. The ones who hold to truth would persevere. Does this surprise you? It’s amazing how hard many churches work to maintain the peace, keep the unity, smooth over doctrinal differences—all for the sake of harmony in the church. Ed Stetzer one time said to us pastors back in March of last year, “If you don’t have at least 10% of the people mad at you at any given time, you’re not doing what God called you to do.” In other words, as Paul told the Corinthian church, gospel work can be an offensive work! The very nature of it is to offend, because the gospel confronts us right where we live. The Word has an affect that few can quantify, but they know it when it happens. 2. Will you remember why this Supper is celebrated? Many tourists go to places all over the land to look at historical venue. Friends of mine went to see the monument at Gettysburg and found themselves genuinely moved as they walked over the battlefield. It stood as a memorial so they would remember the fallen men who died for their respective countries. Washington, D.C. has a number of places which are memorials (Washington Monument, the Jefferson Memorial, the Lincoln Memorial, Arlington National Cemetery, etc.) that do not simply serve as historical markers but as reminders—so we may recall the cause, the sacrifice, give thanks, and live under the banner of freedom that they helped provide in this country. Even though this is recorded in Matthew, Mark, and Luke, chronologically this is the first place to record this. Paul even says, “I received from the Lord what I also delivered to you.” He received this directly from the Lord Jesus. And in turn, he passed it along to the Corinthians (and ultimately to every generation since). Notice something interesting here. Jesus took this meal on the Passover (we’ll show why this is important later on), the night prior to his crucifixion. Paul writes that the Lord took bread “on the night when he was betrayed” (v. 23). Paul could have written that Jesus broke bread on the Passover. He could have written that he broke bread on the night before his crucifixion. But he didn’t write that. Why? The Holy Spirit inspired Paul to convey that this beautiful ordinance was established right before the most heinous sin ever committed by any man—that of Judas Iscariot betraying the Lord Jesus Christ. In the midst of great sin by one of his own disciples, this takes place. Why? Go back to what was said about division. God uses division to show who is truly genuine. Here, he knows what Judas would do in the Garden—so he brought them together to strengthen them. When division hits in the church, God brings his faithful together to strengthen them. How? By reminding them of his work of redemption. He reminds them that they are redeemed through His work, justified thoroughly! It seems that there was a man in England who put his Rolls-Royce on a boat and went across to the continent to go on a holiday. While he was driving around Europe, something happened to the motor of his car. He cabled the Rolls-Royce people back in England and asked, “I’m having trouble with my car; what do you suggest I do?” Well, the Rolls-Royce people flew a mechanic over! The mechanic repaired the car and flew back to England and left the man to continue his holiday. As you can imagine, the fellow was wondering, “How much is this going to cost me?” So when he got back to England, he wrote the people a letter and asked how much he owed them. He received a letter from the office that read: “Dear Sir: There is no record anywhere in our files that anything ever went wrong with a Rolls-Royce.” That is justification. So Jesus pulls two items from the Passover meal: the unleavened bread and the wine to institute the new covenant in his blood. Here, a lot of controversy has taken place over what “this is my body” and “this is my blood” means. In Roman Catholic circles, the elements become the actual body and blood of Christ. This came about in a reflection of heretics who were around in the 1100s who did not believe that Jesus actually rose physically and fleshly from the dead. So in RC dogma, by the word spoken by the priest, it turned into the actual body and blood of Christ. Yet, we understand that the actual body of Jesus from the clear teaching of Scripture is at the right hand of the Father (Acts 1:11). It is a symbol, a sign that signifies a reality. So while this may not be the actual body and blood, it is not “an empty symbol.” It is a powerful sign of the present reality of Christ. And the body and blood was broken why? Ephesians 1:7 says that we have redemption through his blood, the forgiveness of sins. Romans 3:25-26 says that Jesus was one “25whom God put forward as a propitiation by his blood, to be received by faith. This was to show God’s righteousness, because in his divine forbearance he had passed over former sins. 26It was to show his righteousness at the present time, so that he might be just and the justifier of the one who has faith in Jesus” (Romans 3:25-26). We are redeemed through the merits and mercy of Jesus Christ whose body was broken and blood was shed in order to be that Lamb of God who takes away the sins of the world! The work is finished—and we are to observe that work to remember and strengthen one another until that day. Doesn’t that sound like Hebrews 10:25? 27 Whoever, therefore, eats the bread or drinks the cup of the Lord in an unworthy manner will be guilty concerning the body and blood of the Lord. 28 Let a person examine himself, then, and so eat of the bread and drink of the cup. 29For anyone who eats and drinks without discerning the body eats and drinks judgment on himself. 30That is why many of you are weak and ill, and some have died. 31 But if we judged ourselves truly, we would not be judged. 32But when we are judged by the Lord, we are disciplined so that we may not be condemned along with the world. 33So then, my brothers, when you come together to eat, wait for one another— 34 if anyone is hungry, let him eat at home—so that when you come together it will not be for judgment. About the other things I will give directions when I come. This supper connects us to the past and the future. Jesus celebrated the Passover, and while celebrating this, issued a new covenant in His blood! There is a solid connection. God ordained that this be observed on Passover. In Exodus 12, we read about the people of Israel enslaved in Egypt for over 400 years. God had promised deliverance through Moses, and was about to do that very thing. The last plague on the people of Egypt was the Plague of the Firstborn. You see, for the Egyptian gods, they had placed ownership on the firstborn males of their people. Pharaoh, seeing himself as a god, though he was lord of all he surveyed. So, after nine previous plagues sent by God, there were nine hardenings of Pharaoh. The tenth was the coup de grace . The death angel came and took the firstborn of all the families, all the livestock—everything. Who was spared? The homes that sacrificed the Passover Lamb, who spread that blood over the doorposts. When the death angel saw the blood, he passed over that house. Do we see the gospel here? Absolutely! Only by the blood of the Lamb, in this case it is the Lamb of God who is Jesus Christ, who was sacrificed for us. As the blood is applied to the doorposts of our hearts to rescue us from the angel of death, we are rescued from the tyranny of sin and being the journey to the promised land! What does it take to get your attention on a matter? Usually something has to happen that is so far out of your control or so far out of the realm of what you think is possible that is shakes you out of yourself, your routine, your comfort zone. The Corinthians were treating their fellow believers shamefully! They were take the meal prior to the Lord’s supper as an opportunity for selfish, arrogant, divisive behavior—and thus were approaching the Lord’s table in a very unworthy manner (GK: anaxios). The result: being guilty of the body and blood of the Lord! God exacts justice by warning those who commit the external physical sin of desecrating the Lord’s Supper by giving them physical sickness and, in extreme cases, death. They not only fail to discern their actions before God and others, they do not even see that their actions are even remotely sinful! Recently, a pitcher from the Chicago Cubs was thrown out of a ball game for protesting (among other things) a blown call. He was so extreme in his actions, that he was suspended six games at a time when his team needed his arm! He did not police himself, and felt no remorse. He forgot that his actions affected his teammates. How do you, dear Christian, approach the Lord’s Table this morning? Donald S. Whitney, Spiritual Disciplines Within the Church: Participating Fully in the Body of Christ (Chicago: Moody Press, 1996), 135. J. C. Ryle, The Lord’s Supper. John Calvin, Institutes of the Christian Religion, 4.17.10, LCC, 2:1371; Quoted in Gregg Allison, Historical Theology, p 654. Preached at Arapahoe Road Baptist Church, Centennial, CO on Sunday, July 29, 2012. By God’s marvelous providence, I’ve had a chance to welcome a number of guests into our church from the area. Some are brand new to church world, others are looking for churches where they can hear the Word preached and taught, and as a ripple effect from that, develop relationships that will help them to stay focused. In other words, people are yearning for discipleship. They are not simply wanting to find a church, they are wanting to connect with Christ. Sadly, for so many, these are not synonymous. Steve Timmis and Tim Chester in their book Total Church, says, “Every Christian is a disciple of Jesus because in the kingdom of God it is only Jesus who has disciples. it is legitimate to talk about Christians discipling one another as long as we recognize that we are describing the process by which disciples of King Jesus help one another to be better disciples of King Jesus” (p. 111). From my observation, there are four areas of discipleship that take place in the life of a local church. None should be dismissed, and they should all be kept in some semblance of balance. The four areas are church, classroom, community, and conversation. In all of these, communication takes place. But as you go from church to conversation, it becomes more interactive, even to the point of having one-to-one conversations. Even then, we have to be careful not to dominate in these areas. Church. In a worship gathering, God has called us to listen to the proclaimed word, administered by a preacher. While some call for more of a conversation, there will be other venues for this mode of communication and discipling. Here, we proclaim, teaching them to observe everything commanded (Matthew 28:19). To think that we do not have discipleship going on in this venue is to miss the entire point of the preaching part of the service. Each of us has a job to do: the preacher preaches as he has listened in his study, the congregant listens as the preacher preaches from the produce of his study. Classroom. While more interactive (at least here, the teacher asks questions or for any insights and feedback), the classroom is still teacher-led. Sunday School traditionally has been like this. And I am a big fan of Sunday School or structured Sunday morning Bible studies. Community. Here, I see people getting together during the week for discipling, accountability, prayer, and study (a book of the Bible, or a book about a biblical topic)—but somewhere other than the church building. This communicates that ministry can happen other than the four walls of a church. This communicates that discipling is not just in a sanctuary or classroom, but in all of life—and in the home, the place where the most influencing takes place. Conversation. It’s amazing that Christians can be together as friends, one-on-one, but go for years without discussing anything regarding their spiritual walk. No praying together, sharing Scripture together, sharing spiritual burdens together. It’s no wonder that so many may come into a worship time and not get much out of it—and spend a good deal amount of time looking at their watches. Our spiritual systems have not been trained to do otherwise. It’s not a lifestyle. Church is simply an event to clock in, then clock out with nothing significant happening and no true reaction to the Word. We must have conversation with Christ in prayer so we can have meaningful conversations with others to help one another grow in the grace and knowledge of our Lord Jesus Christ (2 Peter 3:18). This is what I would like to see at ARBC. Thoughts? — John Calvin, Institutes of the Christian Religion, 4.17.10, LCC, 2:1371; Quoted in Gregg Allison, Historical Theology, p 654. It is a wondrous love, an amazing love—but what kind of love is this that we speak of in this passage? When we begin to look at the different ways not only the world speaks of God’s love but also the way the Scriptures speak of it, no wonder that D.A. Carson penned a book based on lectures entitled The Difficult Doctrine of the Love of God. The peculiar love of the Father for the Son, and of the Son for the Father (John 14:31). God’s salvific stance toward his fallen world (not the bigness of the world, but of the badness of the world). God’s love toward His people in a provisional way –provisioned on obedience (Jude 21). 1. The Son of Man must be lifted up so we may live. But we must understand what Jesus is talking about. Jesus is talking to Nicodemus, a Pharisee and a ruler of the Jews. Remember how the Pharisees were ones who sought to preserve and protect the Law, that is, the Scriptures. They knew the Scriptures backwards and forwards. So when Jesus said basically in passing, “And as Moses lifted up the serpent in the wilderness,” Nicodemus immediately connected. However, we may not, so let’s connect it to see what Jesus means. What we see here is a rebellion against the protection and provision against the very God who made them and delivered them! But there’s more to it. The people of Israel could not go through Edom, so they went around, turning their back on the Red Sea that, had they crossed it, would have put them in the Promised Land. They grew “impatient–” and let it flow in their grievances. George Matheson once noted, “The hardest thing is that most of us are called to exercise patience, not in the sick bed, but in the street.” The people of Israel struggled with this—and so do we. The fact is, patience is not something with which we are naturally endowed. Patience is a part of the fruit of the Spirit. It’s not about being patient when things are going your way, but when things are not, when the timing is not, when the plans are not. And so they spoke! Notice a number of things: (1) they lamented being delivered by God’s grace out of their slavery; (2) they bemoaned that they had no food or water, but they acknowledged there was some food, but they deemed it worthless. It was the manna and quail that God provided, without them having to lift a finger to make it. They rejected God’s grace. So God sent fiery serpents on the people. God was powerful enough to demonstrate mercy, but also powerful enough to send justice! And here we see a subtler message Jesus gives to Nicodemus—don’t reject the message and provision that God has provided in the message Christ was giving them. But God also gave them a remedy: put a bronze serpent on the pole, which all that looks up will go from death unto life. As they looked up in the wilderness and received physical life by God’s grace, so they could look up to the Christ lifted up and have eternal life. 2. The Son must be sent down so we may be lifted up (John 3:16-18). “For God so loved the world.” For many of us, this begins the most treasured verse in all of Scripture. But for many others, this is brand new. When one looks at Tim Tebow’s stat line in the playoff game against Pittsburgh, he was 10 of 21 for 316 yards, averaging 31.6 yards per game. The Steelers’ time of possession was 31:06. CBS’ final quarter-hour overnight ratings were, yes, a 31.6. But as a result of this, millions of fans Googled John 3:16, causing this verse to spread all over, with ESPN writers like Adam Schefter printing it out in full on an article dated January 13, 2012. I pray with further understanding, we may give even more glory to God. What does this phrase mean? Does it mean intensity—God loved the world sooooo much? While God does love those whom He created with great intensity, there is better way to look at this. Suppose you’re teaching your child how to folk a pair of pants. I showed my boys the other day, “You fold them in half, then in half, and in half.” I could have said, “You fold it just so!” In other words, you fold it in this manner. The point? Jesus is telling us, “God loved the world in this manner.” He demonstrated His love in this way! Other versions have translated this verse in this manner, and some have objected to it. May we not treasure a translation so that we neglect the meaning! As we saw last Sunday when a dear sister came to recommit her life to Christ, we were reminded that we cannot climb a ladder of our own righteousness to get to God, but we do understand that Christ came down! God gave His Son (v. 16) and God sent His Son (v. 17). The phrase that is translated, “that whoever believes in him” needs our attention as well. In the original, the word ‘whosoever’ is not there, but in essence it says, “all of the believing ones.” The word ‘whosoever’ is misleading—not just anyone could have everlasting life, but in connection with what Jesus said earlier, only those who have been born from above, born of the Spirit. We are dead spiritually, and can only be made alive if God makes us born again. Paul lets us know this, that “God, being rich in mercy, made us alive in Jesus—by grace you have been saved” (Ephesians 2:4). Though we were dead in our sins, God raised us up! This is why God sent His Son! In verses 17-18, we see Jesus telling Nicodemus that God sent Him into the world not to judge the world but that the world might be saved. Again, remember what’s being said and to whom. He’s speaking to Nicodemus, and Nicodemus and his fellow Pharisees thought and taught that only the Jews would be saved, and the Gentiles would be damned. But Christ came to rescue not just a people from one tribe, but from every tribe, language, people, and nation. But isn’t this wonderful: whoever believes in him is not condemned. Why? Jesus took our condemnation! Romans 8:1 says, “There is no condemnation for those who are in Christ Jesus—for the law of the Spirit of life has set me free from the law of sin and death.” If you are in Christ Jesus, there is no condemnation. You are free from sin and death. But there is condemnation for those who are not in Christ Jesus. 3. We must be held up by the Son we may not be sent down (John 3:19-21). What is the essence of the judgment that Jesus defines here in verse 19? These words may sound familiar, since they echo John 1:10-11. The judgment is ultimately this, “What will we do with the light that has come into the world?” By nature, people love the darkness rather than the light. Do we not truly understand this in fullness after Friday’s atrocity in Aurora? Alex Teves, Jon Blunk, John Larimer, Mikayla Medek, Alex Sullivan, Rebecca Wingo, Jessica Ghawi, Matt McQuinn, AJ Boik, jesse Childress, Gordon Cowden, and Veronica Moser-Sullivan. Twelve victims, shot down in a senseless act of violence at a time when many simply expected to go and enjoy a movie. Twelve murdered and 59 wounded! This news made it internationally—my Trinidad pastor friend, Roddie Taylor, e-mailed me to make sure I was OK. Yes, it made it that far. And yes, everyone was mortified. Each of them the recipient of a senseless, ridiculous shooting. Listening to the survivors of this shooting, you could see the terror on their faces and hear it in their voices. Some expressed an array of emotions from fear to anger to despair. Two weeks ago, Jerry Sandusky, former defensive coordinator at Penn State University, was sent away for good after the abusing innocent boys. When the authorities found out about it, they smoothed over it—looked the other way. They did not report this to the authorities. Everyone understands the evil of these two men who committed these heinous crimes. What most everyone does not understand is that this would be everyone of us without the restraining, efficacious grace of God. By nature, people love darkness rather than the light. For instance, one man shot was lauded for being a hero for protecting his girlfriend and giving his own life. Yet, his wife from whom he was separated from still lived in Reno and is raising money to bring his body back. This man’s lifestyle is more acceptable in our culture than James Holmes’ or Jerry Sandusky’s—but it is still not the way God created us to be. It is still preferring light over darkness. Jesus gave Nicodemus a definition of judgment: the light has come into the world, but it the object of their love that condemns them. We often believe that people are pounding on the door of heaven for God to let them in, but that is not so. Outside of Christ, we do not love him—we run as fast as we can away from him. God’s wrath is revealed against mankind who suppress the truth of God in their unrighteousness. God has made himself known in creation so they are without excuse. People neither honored God nor gave thanks, and their hearts were darkened. They exchanged the Creator for the creation, worshiping that which they could see. God gave their over to their passions and desires to do unspeakable things. When Jesus tells Nicodemus that people loved the light more than darkness—and by ‘light,’ we are not talking about particles or a physical property, but a person (John 8:12), rejecting Christ means we are doing what our depraved nature says. We may say, “I’m not as bad as that murderer.” Jesus said, “If you have anger in your heart, you’ve committed murder already.” Well, at least I haven’t cheated on my wife. Jesus tells us if we have lusted in our hearts, we’ve broken the adultery commandment. Until we truly understand the depravity and sinfulness of our hearts, we will not appreciate nor be amazed at what Christ accomplished—He came to rescue us from our own hearts! You can download the entire audio ESV New Testament (mp3 version) free at Amazon! Jesus, as the Scripture recently said, “knew all people … for he himself knew what was in man.” No matter our situation, no matter our background, no matter our family, no matter our jobs, no matter our wealth or fame—He knows what is in us. He knows what fuels us, what motivates us. After all, Scripture tells us that “everything was made by him and for him” (Colossians 1:17). The truth is, neither pollsters nor politicians came up with this phrase. Jesus did! What does it mean? And why do we need to be born again? Because Jesus knows all men and what makes them tick—and the only antidote to the cancer of our sinful, fallen nature is that we must be born again, born from above, born of the Spirit. 1. You cannot see nor enter the Kingdom of God (John 3:1-3). Nicodemus comes to Christ by night. Some speculate that this not only refers to the time of day, but to the moral and spiritual condition of Nicodemus—an interesting insight, considering he was a ruler among the religious leaders. Pharisees knew the Old Testament—had to have it all memorized—and sought originally to preserve the purity and authority of the Scriptures centuries prior. But soon, their interpretations of Scripture (originally intended to rightly divide the Word) because just as if not more authoritative than the Word itself. Nicodemus was a ruler of the Jews, the elite of the elite who knew the Word of the Lord—but by the way he approached Jesus, he did not know the Lord of the Word. But he recognized something powerful in Jesus—even attributing this power to the presence of God in him. He wasn’t the only one. Rabbi, we… He, like so many who “believed” in him did so because of the signs—even those who were from the Pharisees. Jesus comes along and says, “Unless you are born again, you cannot see the Kingdom of God.” How rich is this phrase! He’s answering a question Nicodemus didn’t directly ask, but again remember, he knew what was in people. He knew exactly what Nicodemus needed to hear. He’s talking to us personally. He tells Nicodemus, and by virtue tells you, you must be born again—otherwise, you cannot see the Kingdom of God. Christ deals with us individually—how is He dealing with you? He’s talking to was spiritually. You cannot be born again. Another way to put this, you must be born from above. We will see from Nicodemus that he did not look at things from a spiritual standpoint. Nicodemus even asked, “Do I need to return to my mother’s womb and start that process again?” He didn’t get it. He’s talking to us eternally. “you cannot see the Kingdom of God.” You cannot truly see and understand his rule. With this, we understand that when Christ calls us to talk to someone, He knows exactly what they need to hear. And when we are born from above, we will see soon that we are also (synonymously) born of the Spirit, sealed by the Spirit, and indwelt by the Spirit, and bear fruit of the Spirit. Nicodemus couldn’t understand spiritual things because he had not been born of the Spirit. Only the Spirit can help us understand spiritual things. And only by the Spirit of Christ will we ever know our situation before God, or how to speak to someone else’s situation. Jesus whetted the appetite of Nicodemus. He threw that out there. Has this whet our appetite? 2. Being born of the flesh is not enough, you must be born of the Spirit (John 3:5-8). What does he mean? “Water and the Spirit” have taken on a number of interpretations. Some have said this means that baptism is a part of salvation. But this is not so, because baptism is that in the NT which is the first step of obedience rather than the last part of salvation. But in reality, we should recognize the person that Jesus is talking to—a Jewish ruler who understood, in some aspect, the intricacies of certain OT symbols. This priestly cleansing of taking the water and sprinkling it on the sacrifice and made them clean. But here is a cleansing of our hearts, of our spirits, from the idols that have made their home in our hearts. He does not merely improve our hearts, he gives us a new one. If you were to take a stone and grasp it, pinch it, throw it and hit it against a wall—it will not feel any pain, it will not feel anything. Each of are born with hearts of stone. Yes, we do have feelings about the things around us, but all of the feelings we have come from our own standards, our own way of thinking and living. But we have a heart that is hardened to the things of God. While, even with this, we can still do good things, this gives testimony to how God has made us in His image—but when it comes to eternal, spiritual things, we have no feeling. We have hearts of stone. But God comes and changes all that! He gives a heart of flesh. Christians become sensitive to the Spirit’s work. We become convicted when we sin, we become joyful and free when we confess our sins, knowing He is faithful and just to forgive us our sins and cleanse us from all unrighteousness! Then he puts his Spirit within us! The Spirit causes us to obey. Our will is freed from the shackles of the slavery of sin, and now set free to obey the Lord by the help of the Spirit! But Jesus goes on, bringing in the issue of the wind. Have any of you here ever had pneumonia? If you have, then you know that it is a breathing (respiratory) condition in which there is an infection of the lung. In the Greek, the root word of pneumonia is pneuma. In the Scriptures, this word is translated word, breath, or spirit. In verse 8, the word ‘wind’ and the word ‘Spirit’ is the same word, so Jesus is using the wind to explain something significant about the spiritual realm. The wind blows where it wishes. You do not know where it comes from or where it goes. It is here we all must take heed of knowing the work of God through the Spirit, and seeing the work of man. Evangelists and preachers have held long to bringing about revivals through man-made means: heart-rending stories, illustrations, scare tactics, and other forms of manipulation to bring people to some sort of decision where they respond to the tactics more than Christ. We do not know how the Spirit will move! We cannot control the Spirit’s movement any more than we can see or control the wind! Revival does not and cannot come in our timing, but in God’s timing! But I love what G. Campbell Morgan once said, “We cannot know when revival will come, but we can set our sails so when the wind of the Spirit blows, we will sail in His direction and not ours.” We do not know when God will change a heart. We can help people to understand and maybe even convince them it is true (chair #1 and chair #2)—but only by the Spirit can he change our hearts to bring us to Chair #3. Poor Nicodemus! How frustrated he must have been? But dear friends, this is the best thing that could have happened to him. He needed to be broken! Jesus asks him, “Are you the teacher of Israel and yet you do not understand these things?” He needed to become desperate. He needed to come to the end of himself. Galatians is a letter for recovering Pharisees. The Pharisees who lived during and after the time of Christ were very religious. They were regular in their worship, orthodox in their theology, and moral in their conduct. Yet something was missing. Although God was in their minds and actions, he was not in their hearts. Therefore, their religion was little more than hypocrisy. Nicodemus’ heart had not changed. His actions were impeccable. His theology surpassed everyone’s. He received every attendance pen and award one could receive for coming to his religious observances. Where did that get him with Jesus? 21 “Not everyone who says to me, ‘Lord, Lord,’ will enter the kingdom of heaven, but the one who does the will of my Father who is in heaven. 22 On that day many will say to me, ‘Lord, Lord, did we not prophesy in your name, and cast out demons in your name, and do many mighty works in your name?’ 23 And then will I declare to them, ‘I never knew you; depart from me, you workers of lawlessness.’ (Matthew 7:21-23). Nicodemus was a ruler of the Jews—that did not help his standing before God. I’m a pastor of a Southern Baptist Church in Denver—that will not help me one whit. Deacons, you being a deacon will not help you one iota. We can have church attendance—nope! Teach Sunday School—uh-uh! We are ‘workers of lawlessness,’ because the Spirit of God has not changed our hearts through the atoning work of Christ. We have trusted in the works of Christ, but not in Christ! The Spirit has not written his law on our hearts. Remember when Samuel was looking for the to-be king of Israel after King Saul lost the mantle. God reminded Samuel that man looks to the outward appearance, but God looks to the heart. Friends, Jesus knows what He is talking about. He descended from heaven and is a witness to His Father’s teachings. He “bears witness to what we have seen.” Not only this, but even more, he describes himself as the Son of Man. What does this mean? And to him was given dominion and glory and a kingdom that all peoples, nations, and languages should serve him. Nicodemus understood exactly what Jesus was saying when he invoked the Son of Man. This was a lot to take in. 38 After these things Joseph of Arimathea, who was a disciple of Jesus, but secretly for fear of the Jews, asked Pilate that he might take away the body of Jesus, and Pilate gave him permission. So he came and took away his body. 39 Nicodemus also, who earlier had come to Jesus[a] by night, came bringing a mixture of myrrh and aloes, about seventy-five pounds[b] in weight. 40 So they took the body of Jesus and bound it in linen cloths with the spices, as is the burial custom of the Jews. Nicodemus came by night at first, but now was out in broad daylight now. To the rest of the Pharisees, Jesus was a criminal who needed to be silenced. Nicodemus treated him with honor, respect, reverence—and even worship! So enough about Nicodemus! The Spirit included Nicodemus as a mirror to our hearts. Do you understand why you must be born again? So now, we see that anyone who wishes to do a study on homosexuality and its effects of the family and culture had better have some politically correct conclusions, or their academic career is at stake. Normally studies like this one are vetted by the scholarly community in subsequent publications. But that is not good enough for the gay activists. The thought-police are out in full force not to counter Regnerus in print, but to destroy his career and reputation. They want him ostracized from the scientific community more generally and from the faculty of UT more specifically. This is what it has come to. It’s not enough to disagree as far as homosexual activists are concerned. You must be thoroughly destroyed. The church needs to realize this! All of us who hold to a Christian sexual ethic will be in the crosshairs. How is it that a blogger can write a letter to the president of the university lodging a very serious, potentially career-destroying professional complaint against a professor, and the university can turn around and effectively put the professor on trial? It’s not enough for Regnerus to be wrong, and his results disproved. He must be professionally destroyed for his thoughtcrime. Whatever happens to Regnerus, the lesson to researchers at the University of Texas is that you should never, ever undertake any research related to homosexuality, unless you are prepared in advance to reach politically correct conclusions. Otherwise, your academic career could be at stake. The Witch-Hunt for Mark Regnerus worth the read! Also worth the read: Kevin DeYoung believes (and rightly so) that no denomination will survive the homosexuality crisis. There is no way, short of a miraculous and full-scale changing of hearts and minds, for North American denominations to survive the homosexuality crisis. Denominations like the PCUSA, ELCA, RCA, UMC, and Episcopal Church will continue. They won’t fold their tents and join the Southern Baptists (though wouldn’t that be interesting!). I’m not suggesting most of our old, mainline denominations will disappear. But I do not see how any of these once flourishing denominations will make it through the present crisis intact. And the sooner denominations admit this sobering reality the better. Read on to see what he suggests. So good! When we parted, he said to me, “I’ll pray for your leadership—you pray for my ‘follow-ship’.” I hugged him and thanked him, promising him that I certainly would. No church is perfect! At least, in my situation, if it was at one time, it lost it’s perfection the moment I set foot on the premises. But you can’t love Jesus and hate His bride. He’s called us to be a part of it with all its warts and wrinkles. We know that He is working in us to make it spotless and without blemish (Ephesians 5:28). “Well, these people haven’t got it together. They just need to get on-board. I’m right—can’t they see that? If they can’t, they must be so worldly as not to know better.” These folks suffer from self-righteousness. Don’t take time to share with them your struggles—they will subtly or not let you know that they just cannot relate to you. If you’re a Christian, you should never struggle with Scripture reading, prayer, witnessing, or any other myriad of activities along this line. You have to lead people from where they are to where they need to be with boldness mixed with compassion (speaking the truth in love—Ephesians 4:15). “Who am I to lead any of this? I’m only a sinner saved by grace, but that’s all. Who would ever want to follow my lead! I can barely lead myself.” Trevin Wax recently posted how dishonoring to the Spirit of God it is to say you’re “just a sinner saved by grace.” Take the ‘just’ out and recognize that the Spirit of God dwells in you through the atoning work of Christ. And recognize that God calls all Christians to tasks, and has gifted all Christians to certain tasks. We were not given a spirit of fear, but of “love and power and self-control” (2 Timothy 1:7). Rest on the fear of Christ, not on the fear of man. “Before we do anything, let’s find out what others think because I’m afraid to make this decision.” This can be a good rule of thumb, especially with your key leaders. In our situation here with the hurt that has taken place over the years from various fronts, the key lay leaders here need to know that the ministry leaders hear them and have an avenue in which to contribute to a conversation. So whenever we make a key decision, they need to be in on the discussion. And when it comes to the congregation, they need to be communicated with clearly. But there is a balance in discussing/communicating, and balancing that with not leading at all until you know where the current is flowing (politicians get blistered for not saying anything until the latest polls are in, then lacing their speeches with those poll-driven talking points.) Leaders have to lead. If this is out of balance, then the leadership and ‘follow-ship’ become reversed. God has placed shepherds and teachers to lead in proclaiming the Word of God and to lead the sheep into His pasture. And we must lead the sheep boldly, instilling in them the confidence that they know the shepherd cares about them and their ultimate well-being. One young minister lamented how people kept getting in the way of his ministry. The older minister replied, “People are your ministry.” There’s wisdom in this reply! Christ has called us to minister to actual people. May we ministers minister, and may all of us have a heart ready for others to minister to us! Those of you who follow me on Facebook known that on Saturday, I did something I never thought I would do—nor had it ever entered into my mind to do it until I moved out here: I climbed a 14er! What’s a 14er? This is a mountain whose summit is over 14,000 feet. So, starting on the northeast face of Mt. Evans by Summit Lake, I climbed 1500+ feet up a 25% rocky incline to the top. It was a cold, painful but exhilarating time with two men with whom I became fast friends. In the process, I had some lessons reinforced. How do you climb a mountain? One step at a time! With the thin air and the 39 degree weather, we would stop every 10 minutes or so to gather ourselves. It took about 90 minutes to climb the 1500 foot zigzag trail (such as it was) up this northeast face. We would look back to see how far we had come, but we would look forward to see how far we had to go—and it was intimidating. We felt at times that the mountain would fall over on top of us. But how did we make it? One step at a time! That’s what God calls us to do! We will not always meet the goals he has for us, but He gives us the strength to put one foot in front of the other and press on! Sometimes the view is impaired, but trust the One Who has been there! 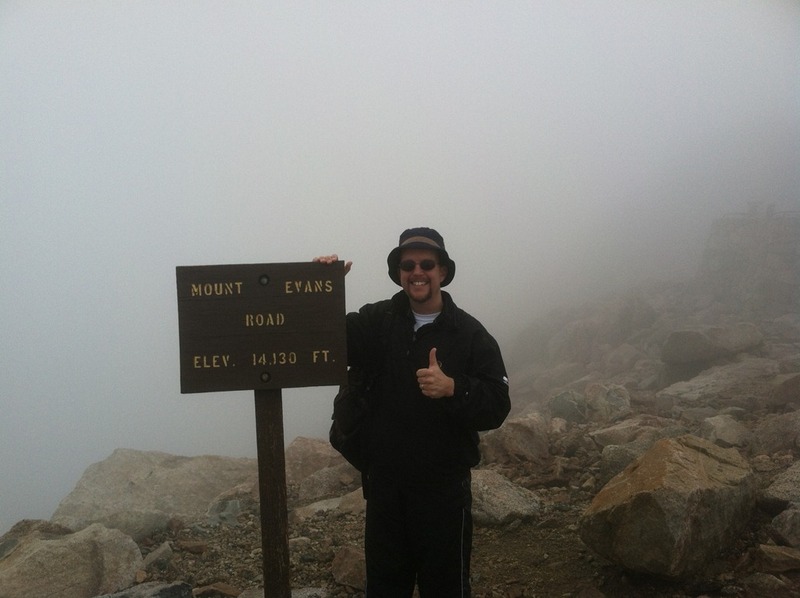 As you can see from the picture to the side, the climb was cloudy! By that, I mean we were climbing inside a cloud. The leader of our group (Bob) told us what a beautiful view it was at the top, but all we could see was gray. We even had pictures at the top to help us identify what mountains we would be seeing, if it was clear. No doubt, there are times in our Christian walk when the view is not clear! We have to trust the one who has the big picture in place and press on, trusting him and his perspective over ours. We don’t always know the trail. We sometimes get injured on the journey. We always need encouragement! I know we did! There are Christians who feel that they should travel alone. Either they feel no one understands them, or they feel they have it figured out enough to where they do not need anyone to help them. Both of these issues will leave a Christian feeling extremely alone because they are both different angles of pride. Put down those walls and recognize there is nothing new under the sun (Ecclesiastes 1:9) and that you don’t have it all figured out. We all need one another! As I was climbing, I would say to my fellow novice climber (Donnie), “Hey Donnie! Guess what? 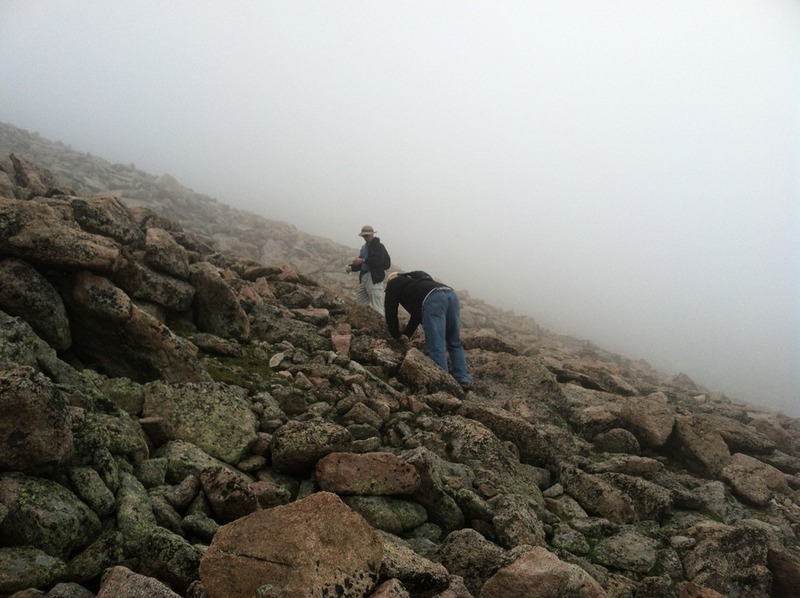 We’re climbing a mountain!” We would stop and (pre-cloud) look at the beauty surrounding us. We would marvel that God could make such art out of nothing! The variety! The beauty! And the sense of accomplishment when we reached the top! Christ empowers us with His Spirit to press on! After my legs calmed down and forgave me for putting them through such struggles, I am ready to do it again! Not simply for the physical accomplishments—I learn a lot about my Savior and about myself in the process.